The Engel MD14F is great for people on the move. This refrigerator freezer is both quiet and efficient. The MD14F is powered by the 12Volt lighter socket in any vehicle and draws a maximum of just 2.8amps. The turn dial thermostat puts you in complete control over the interior temperature. Whether you need a fridge or a freezer, just turn the dial! High Quality Insulation helps maintain the interior temperature even after unplugging from power. The less frequently the unit is opened the longer it will remain cold inside. 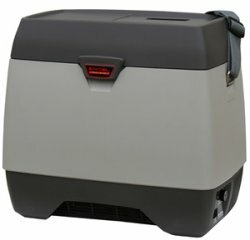 This refrigerator freezer can be taken just about anywhere over your shoulder with the included shoulder strap which makes it even more portable. Optional AC Power Supply is available so it can also be powered in your home or office. This is especially helpful in pre-cooling. This way it's already cold before filling with your perishables and hitting the open road. Inside Dimensions: 13.7" x 7.5" x 8"
Outside Dimensions: 17.5" x 11.25" x 15.6"
Shipping Dimensions: 20" x 14" x 17"
works great when taking field samples. holds temp very well and achieves max cold quickly. The 12 Volt DC Refrigerator was a needed investment that works great. The medication I'm on has to be keep cold and I work on the road which made it hard for me. This product works great and now I don't have to worry. Thanks so much.